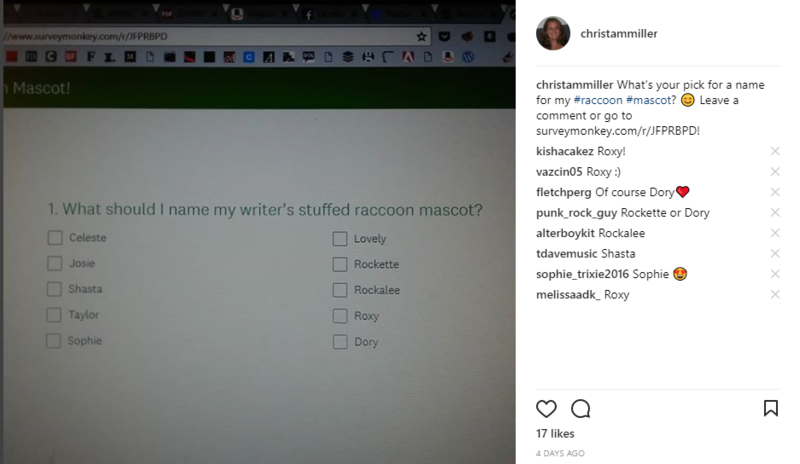 The raccoon’s name is Roxy, and the winner (who suggested it first) is Cathy Coley! And there was a surprise towards the end of voting — a name that a single IP address voted for 7 times. No other IP address voted multiple times, so I had to disqualify six of those entries, making Roxy the clear winner. 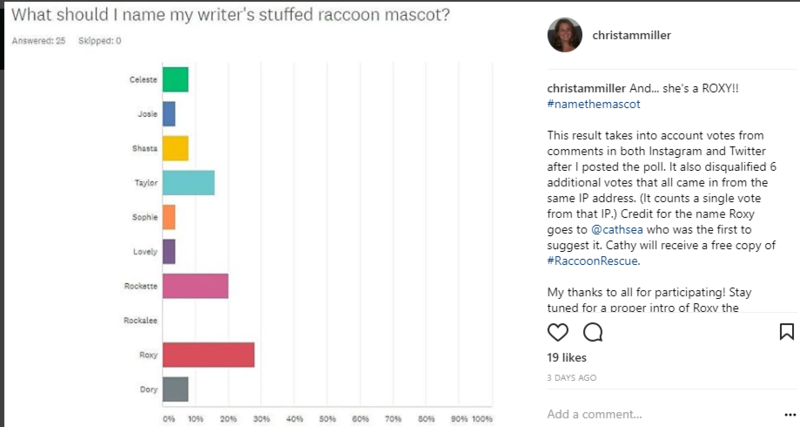 Things I could have done differently… I could have drummed up additional buzz by posting the contest on different writers’ groups and listservs. 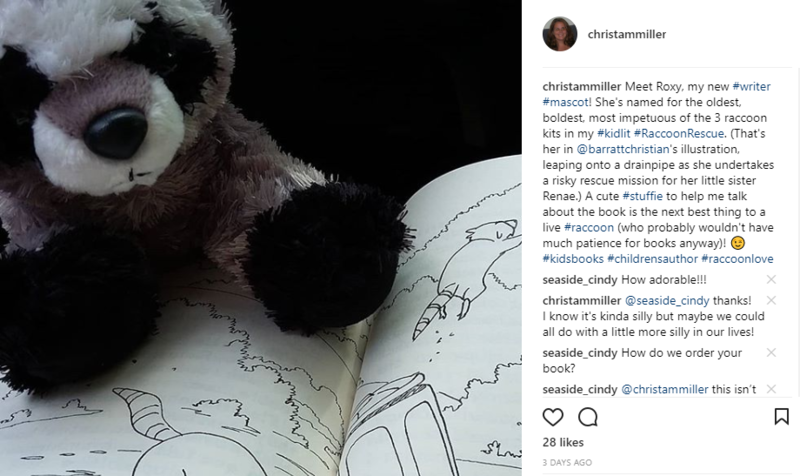 I did make my Facebook posts public, of course, and my Twitter and Instagram accounts are public, but I didn’t stress about counting eyeballs because, well, this was a fun, lighthearted, ad hoc thing that I just didn’t want to stress about. Did you know, though, that the three raccoon kits’ personalities were written to match real-life behavioral patterns? In my head I fist-pumped the air when my rehabber friend, reading the story, remarked, “There’s always that one!” when I introduced Renae, who had been hiding behind her mother. Roxy, Rufus, and Renae are all “that one” in a litter: the feistiest, the hungriest, and the shyest. In fact, these characteristics are important in nature. A feisty raccoon is a great self-defender, and defends her kits, too. A good eater is a good scavenger. And a shy raccoon is good at practicing caution. She isn’t too quick to approach strangers or new situations where she might get hurt. Stuffed Roxy is, of course, not as full of as much personality as her namesake! Or… is she? In the spirit of other stuffed animal Instagram accounts (not, mind you, that I necessarily want her to be a celebrity! ), she might just turn out to be feistier than her sweet-looking nature appears! Where would you like to see Roxy next? Leave a comment! 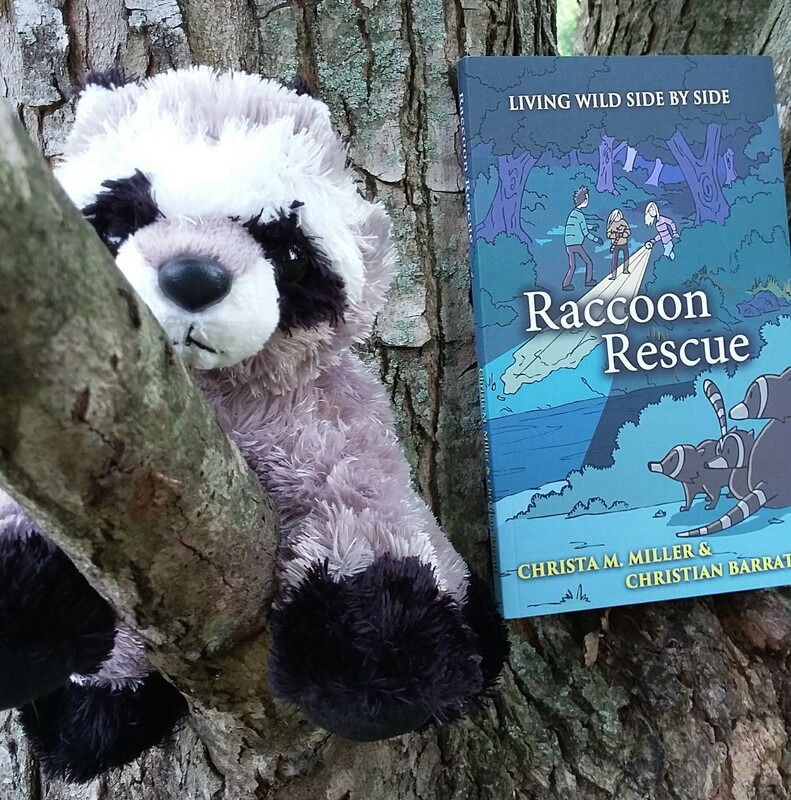 Book giveaway contest: Name my new raccoon mascot! Thanks for linking to my page and book! The contest was fun, and of course, I had to suggest Roxy. When I discussed with C, she said she likes Renae, too! How about on a fun adventure. Meeting new friends of a different species. And possibly bringing home a sister????? So what the two of you are telling me is, next time I go through Toronto I have to pick up little sister Renae so the two of them can go on adventures together!